Silverfish are flattened insects that are wide near the head and narrowing toward the rear of the abdomen. They are wingless, covered with scales and have long slender antennae. Silverfish are insects that develop without metamorphosis and have chewing mouth parts. They are covered with silvery-gray scales. 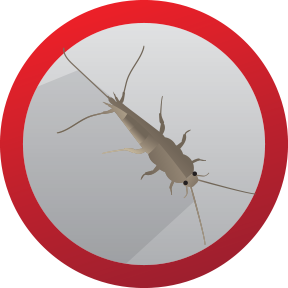 Silverfish normally live in moist areas indoors or out, and can be usually found underneath boxes, boards and debris. Silverfish feed upon starchy and protein materials such as natural fabrics, rayon, highly refined paper, glue and paste, books and linens. They commonly leave yellowish stains on the materials they feed upon. Because of their nocturnal habits, silverfish are often not noticed during the day. Bug the Bugs © 2017 All Rights Reserved.